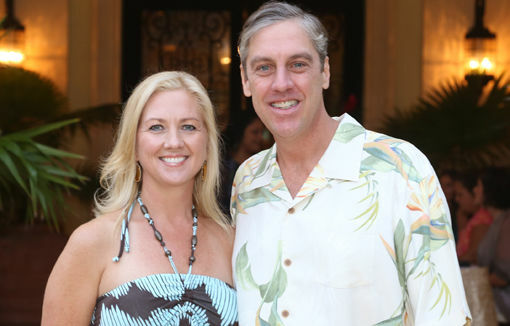 PALM BEACH GARDENS, Fla. – Supporters of The Open Door, a leading organization for mentoring teen mothers in Palm Beach County, celebrated in casual Tommy Bahama-style its inaugural “Unlock the Future” fund-raiser at the Old Palm Golf Club. Guests included Linda and Jon Drettmann, Sheri and Jeff Nelson, Sherry and Mark Murphy, Ellen and Chuck Hobbs, Dr. Chris Ramsey, Dr. Karina Leal, Michelle Eassa, Liz Quirantes, Lisa and Charles Gerardi, Erin and Sean McGould, and Charles Bender. More than 100 supporters gathered on Nov. 9, 2013, to enjoy wine and beer, cigar rolling, closest to the pin and a chance to win auction items including trips to Pueblo Bonito’s Oceanfront Resorts & Spas, a private home in Cabo San Lucas, Xbalanque’s Resort Villa in Honduras, the Black and Blue Marlin Fishing Club in Costa Rica, a 4,100-square-foot condo on the beach in Miami Beach, as well as a Wine Sage wine tasting for a party of 10 and a wine tasting aboard a 100-foot yacht, compliments of Chatteau Tanunda. For more information, visit www.mentorsforteenmothers.org or call Deana Cerniglia, (561) 329-2191.